This is the first month of the new Year of the Pig! 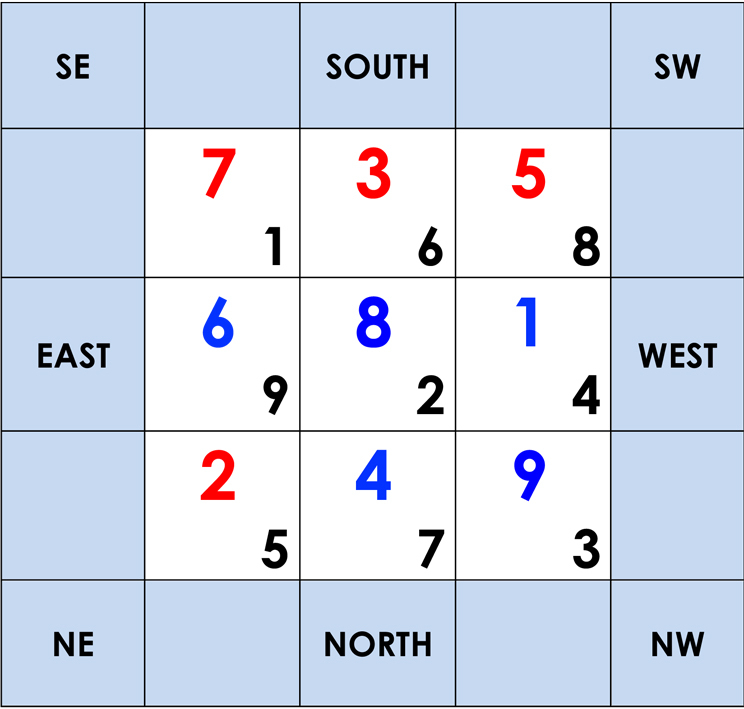 Please note that both numbers in each grid have changed as this new chart includes the new energies of 2019. If you haven’t already done so, now it is time to update your Feng Shui for the New Year. There is good wealth and career luck to be enjoyed by those staying in the SE this month, but a lot of extra effort is needed. Don’t rest on your laurels! You can activate the victory luck brought by the No 1 Star with a Five Element Victory Banner or a Wind Horse Lumi Tile placed on your desk. Wealth luck can be activated with a water feature in the SE this month. The annual stars are now moving into their new position and you also need to protect yourself and your home from the annual No 7 Burglary Star. Display an Anti-Burglary Lumi Tile or the Red-Faced Sitting Kuan Kung in your SE to protect from accidents and break-ins, as well as mistakes that may cost you financially. The SOUTH is another lucky sector this month, enjoying heaven luck and unexpected windfalls. Residents will receive help and might even take home some monetary winnings, also those born in the Year of the Horse and living in SOUTH facing houses. To enhance this auspicious energy, display a Wealth Ship in your SOUTH (sailing in from one of your auspicious direction) and carry a Wealth Ship Amulet or a Buddha’s Foot Amulet. However, there is also aggressive energy brought by the annual Quarrelsome Star, and health luck is unfavourable for young women. If you stay in the SOUTH of your home, it is best to avoid long distance travel and be very careful when you drive – look out for dangers and don’t speed! Place a Healing Herbs Wu Lou in this area to protect your health. The No 8 Star brings fabulous wealth luck and financial success this month, especially to those born in the Years of the Sheep and Monkey and the matriarchs. Also those staying in the SW could be extremely lucky. Use this opportunity of a great start into the new Year of the Pig and enhance your SW with the Bamboo Forest of Prosperity to bring financial luck. Spend more time in your SW to enjoy and activate its auspicious energy. If your dining room is here, host dinner parties this month! The annual Misfortune Star is not so pleasant to deal with, however. Those people mentioned earlier and the matriarchs should protect themselves by carrying a Tri-Coloured 5 Element Pagoda Amulet. Please also place a large 5 Element Pagoda in your SOUTH as the Misfortune Star is very strong this year. More money luck comes to occupants of the EAST this month! You can enhance the positive wealth energies with a Golden Tara Home Protection Amulet, which will protect you against hostile forces at the same time. Unfortunately, the elements of the two stars are clashing, which might cause problems between the older and younger generations of the household. Hang a Qui-Ren Windchime in your EAST to calm this affliction. If it is a bedroom, use Red Apples with Peace Symbol or Six Smooth Crystal Balls to calm the energies and carry an Apple Peace Hanging when you are out. The Centre enjoys the “Sum of Ten” combination which brings wonderful good fortune to everyone! Homes with an open-plan design will benefit particularly, as the energy can flow easily into other areas of the house. There is good speculative luck and even possibilities of a windfall. For those who enjoy gambling, Lillian Too has specially designed a Victory in Gambling Amulet to activate this luck. Wealth luck really is very strong this month and you can enhance this with the sacred cow “Kamadhenu” placed in the Centre. 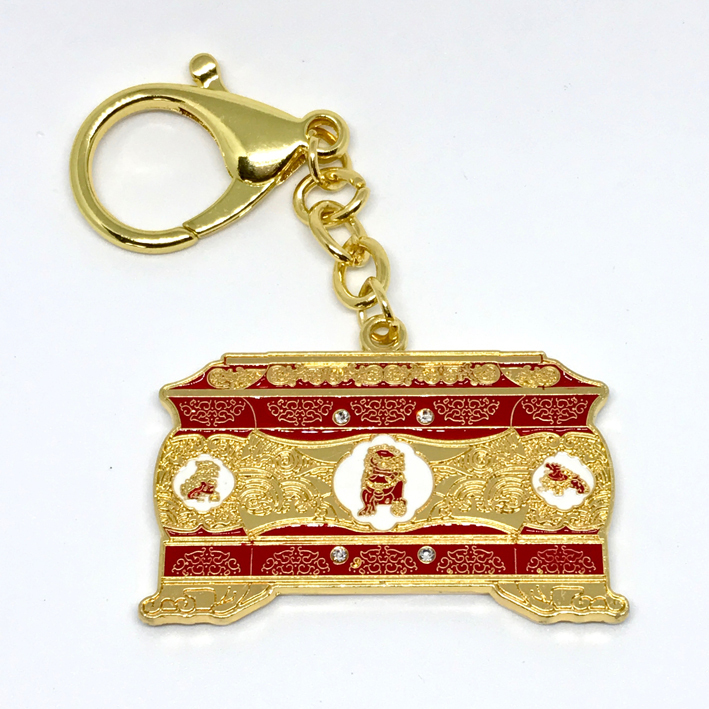 The Fu Dog Treasure Chest will also attract the excellent great good fortune luck this month and you can carry a Treasure Chest with Lucky Cat Amulet. Be aware of the monthly Illness Star though and place a Healing Herbs Wu Lou in your Centre area. In addition, carry an Anti-Illness Amulet to protect your good health. There is positive energy in the WEST, bringing inspiration to designers, writers, and people in creative jobs, as well as study luck for students. Those staying in the WEST will also enjoy promotion luck at work, so stay focused and show what you can do if it is time for the next round of promotions! To further enhance your career luck this month you can display a Bejewelled Flying Wind Horse in the WEST of your home or office and carry a Key for Success & Victory Amulet or a Wind Horse Amulet. To help with academic achievements you can display a Sage with Tiger or a Chinese Calligraphy Set and carry the Scholastic Success Amulet. Those staying in the WEST and those born in the Year of the Rooster will also enjoy increased romance luck this month. To give this a boost, display a love enhancer such as the God of Love and Marriage in your WEST or the WEST of your bedroom. This is a dangerous month for those staying in the NE and potentially those who are born in the Years of the Ox and Tiger. The annual Illness Star and monthly Misfortune Star are coming together, bringing misfortune in the form of loss of money and relationships. Expect lots of problems and obstacles. The stars must be subdued or residents might get seriously ill.
Place a Garuda Bird or a Healing Herbs Wu Lou in your NE for protection and keep this area as quiet as possible. Keep the lights dimmed. Those persons mentioned above and those living in NE facing houses should definitely carry an Anti-Illness Amulet this year to protect from falling sick. Those with bedrooms in the NORTH of the home or living in NORTH facing houses should be extra careful when travelling and doing sports, as mishaps and accidents are likely. This also applies to those born in the Year of the Rat. The elements of the two stars clash, which leads to increasing disagreements with your spouse/partner and possible betrayal in matters of the heart. The monthly No 7 Star is violent, and you can subdue this by placing a Red-Faced Kuan Kung or an Anti-Burglary Lumi Tile in your NORTH. In addition, it would be good to carry an Anti-Robbery Amulet. The negative energy might also bring illness related to the lower abdominal area and the thighs. The monthly No 3 Star is very aggressive and can cause serious arguments leading to fights or even lawsuits. Remove any plants from your NW this month and keep activities to a minimum. Display the Red Apple with Peace Symbol or hang a peaceful red painting such as the Scarlet Lotus Buddha to help restore peace and calm the quarrelsome energies. Those whose bedroom is located in the NW, the patriarchs and those born in the Years of the Dog and Boar ought to carry an Apple Peace Hanging to prevent falling out with others or getting into trouble with the authorities.